Tony Blair has refused to apologise for the security situation in Iraq, saying he bears no responsibility for it. The prime minister told BBC Radio 4 that extremists trying to thwart Iraq's democracy were to blame for attacks. "I don't think we should be apologising at all for what we are doing in Iraq. We're trying to support the democrats against the terrorists," he added. 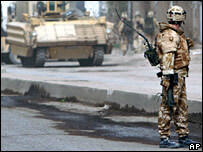 The UK is to withdraw 1,600 troops from Iraq but Mr Blair said numbers could increase again "if we're needed". He told MPs on Wednesday that the remaining 5,500 troops would stay until 2008. However, when he was asked about reversing that decision on the Today programme, he said: "I don't want to get into speculating about that because we have the full combat capability that's there. "So, if we're needed to go back in any special set of circumstances we can, but that's not the same as then increasing back the number." He said he bore no responsibility nor would he apologise for the "terrible" security situation in Iraq. "I don't think we should be apologising because we're not causing the terrorism. "It's being caused by internal extremists who are linking up with external extremists. And 80-90% of that violence is in or around Baghdad and it's being caused deliberately in order to stop the government of Iraq - which 12 million people voted for - from functioning." His assessment was at odds with comments by the former British envoy to Iraq, Sir Jeremy Greenstock. Sir Jeremy, in the BBC documentary Blair: The Inside Story, said Mr Blair had taken his "eye off the ball" in the aftermath of the war and that no one in those early days had focussed on the security of Iraq. "There was a vacuum from the beginning into which looters, saboteurs, the criminals, the insurgents moved very quickly." And Lord Butler, who chaired an inquiry into the intelligence behind the decision to go to war in Iraq, said in a House of Lords debate that Mr Blair did share some of the blame for post-war violence. He said: "The prime minister's centrist and informal approach to running the government prevented all the resources available in departments on this aspect from being brought into play. "We know that the International Development Secretary at the time, Clare Short, tried repeatedly to get the Cabinet to focus on post-war Iraq and got short shrift for it." But Mr Blair has dismissed suggestions coalition forces had been unprepared for the aftermath of war, particularly the sectarian violence. He told Radio 4 the Iraqi police force then was "an instrument of Saddam's dictatorship" and it would always have been the case that it and the army had to be rebuilt "from scratch". "Now, you can argue about - and I've already been back over it myself - about whether you could have disbanded the army differently and so forth, but it isn't the principal reason you've got a problem in Iraq," he told the BBC. "The principal reason you've got a problem is, as I say, because there are elements deliberately giving you that problem." Blair: The Inside Story will be broadcast on BBC Two on Tuesday, 27 February, at 2100 GMT.